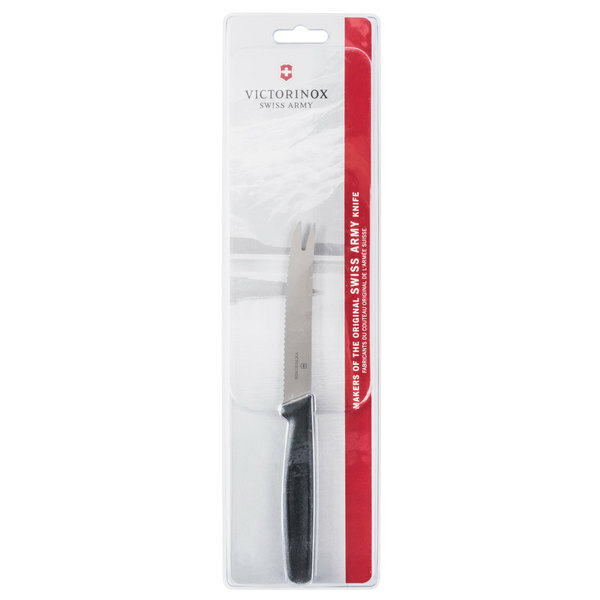 Use this Victorinox 6.7863 4 1/4" serrated edge tomato knife with black polypropylene handle to tackle a variety of cutting tasks! Combining the versatility and value your business requires with the professional quality you've come to expect from Victorinox, this knife is sure to become a favorite in your commercial kitchen or bar! Its serrated edge is perfect for cutting through tough skins on tomatoes, slicing sausage, and cutting cheese, while its forked tip allows you to lift and move the food item with ease. 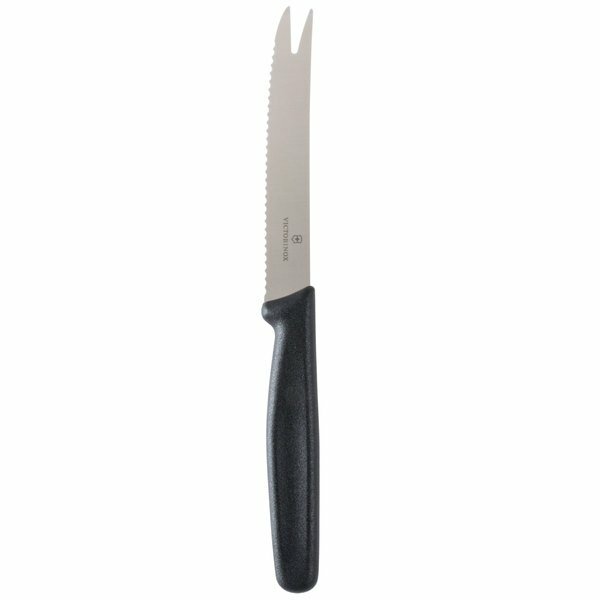 Great for a variety of cutting tasks, this versatile knife is the perfect addition to any establishment. "This knife is perfect for tomatoes! The serrated edge means that you can cut tomatoes without the dangerous slipping, and it is just long enough to fit comfortably in your hand!" This knife allows you to pierce and spear slices of tomato, cheese, and sausage after slicing, allowing you to lift and move them on to a presentation board for maximum efficiency. This is also great for sanitary purposes because your prep cook or bartender does not need to use their bare hands. It also saves time by allowing them to use the same utensil to cut and serve the food item. Crafted from high-carbon stainless steel, this knife's blade is built strong and will provide you with smooth, accurate slices. The high-quality blade won't even discolor or corrode over time. 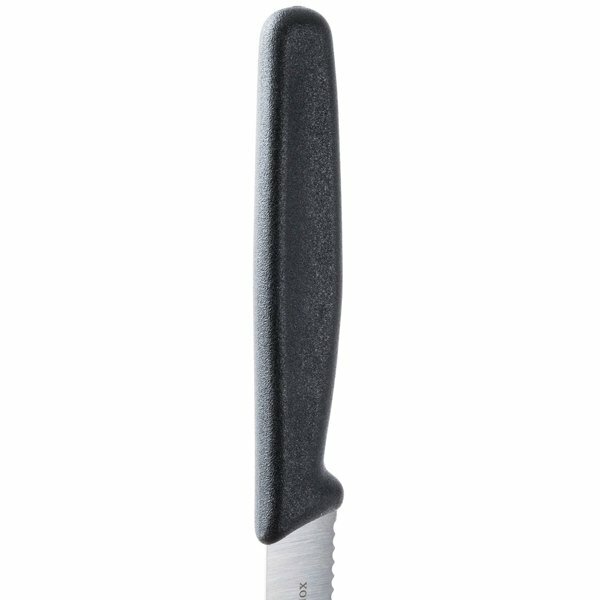 Featuring a durable, hygienic polypropylene handle, this knife is simple to clean and is contoured to make it more ergonomic for long periods of use. Designed to effortlessly cut fruits and vegetables, this knife is perfect to use for garnishing Moscow Mules, daiquiris, or your own signature concoctions. However, this multi-functional knife is also great for slicing through tough skins on tomatoes, as well as cutting and serving cheese and sausage. 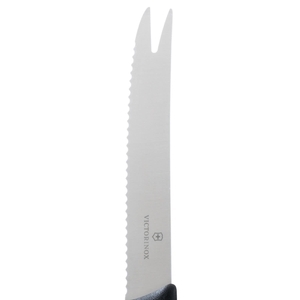 Whether you need it behind your bar or in your kitchen, this knife will get the job done! This is a extremely useful knife I make stuffed chicken caprese and I use this knife to cut the monzrella and the tomato’s. I love how I can cut a tomato so thin with this knife. I don’t use it a lot but it’s a great knife for the price. Originally we thought this knife would be a bit redundant for cutting tomatoes versus our small serrated paring knife, but this knife is truly incredible. The blade is extremely thin and sharp, making it excellent for making very fine slices of tomato without crushing the inside. While this knife is definitely perfect for tomatoes because of the serrated edge, I find it is useful as an all-purpose paring knife in the kitchen. Great price, I highly recommend! Excellent tomato knife. Greatest tomato knife i have ever found. However shipping cost are excessive. Using this knife makes slicing tomatoes so precise and easy. always slices the same. Everyone should have one on hand, and the price is so good. 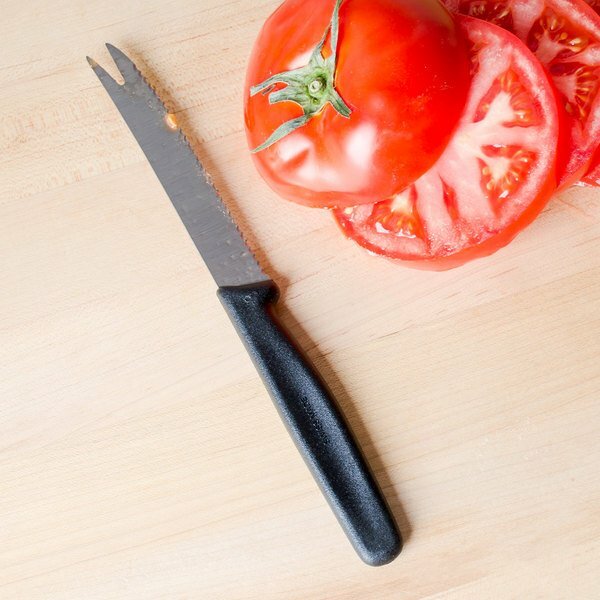 This knife is perfect for tomatoes! The serrated edge means that you can cut tomatoes without the dangerous slipping, and it is just long enough to fit comfortably in your hand! My favorite knife. Serration protects blade's sharpness. Perfect size for slicing tomatoes and other vegetables. Great grip and feel. Will slice through anything with ease. This tomato knife works really well! i was surprised at how easily it sliced my tomato...I did not expect such performance with such a low price. I definitely recommend. 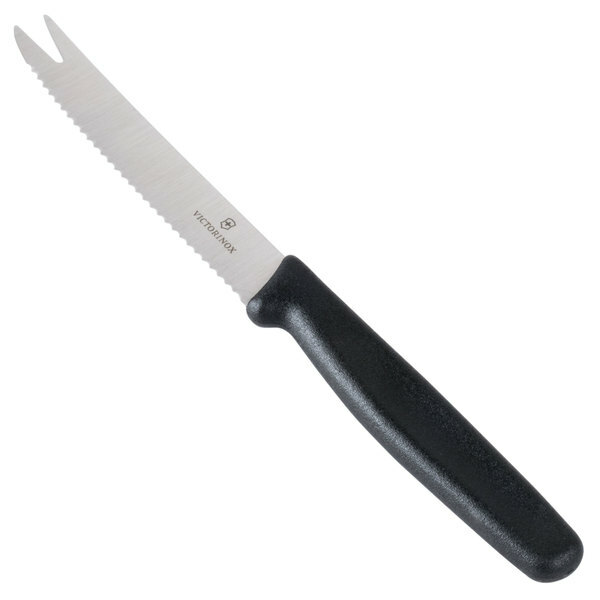 I think the serrated edge would also work well for bread and bagels. 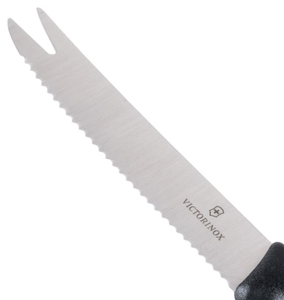 The vicorinox serrated knives are classics for a variety of tasks. This tomato knife is nice, but I don't find any utility in the forked end. Good knife overall though. I found myself using this knife over my more expensive knives since I got it. It's perfect for slicing cucumbers, tomatoes, squash along with more delicate produce such as mushrooms or eggplant. I even use it to do the scoring on my bread dough before baking. 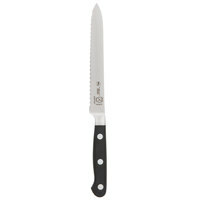 The Victorinox 4 1/4" Tomato Knife with / Nylon Handle. 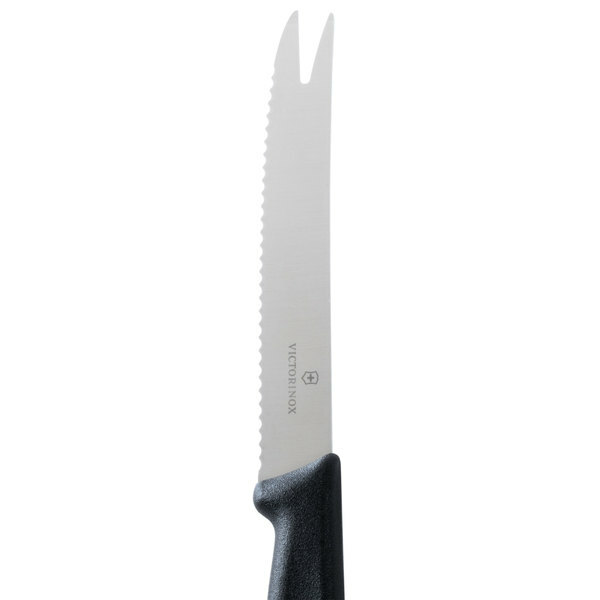 It features a serrated blade made of high carbon stainless steel, with forked tip for serving tomato slices.The price is great to. ive always used a general bread knife to slice tomatoes with. boy was this knife a step up works great and keeps the edge for a long time. for the price what a great buy. I bought this knife because I needed to slice tomatoes quickly, consistently and neatly. This knife does the job of making the task of slicing tomatoes a breeze. The knife is light and comfortable, and the blade is excellent for tomatoes. I recommend this knife to every kitchen because everyone slices tomatoes at one time or another, and this knife IS the tool for the job. The price of this knife makes it a great value, because it is such a low price, so you can't go wrong with it!